Walk down the aisles of any Australian supermarket, and you’ll be amazed at the number of choices for toothpastes and tooth whitening products. Trying to decipher which ones work and which don’t is as much of a challenge as trying to pin down a diet that “really works”. So, does that mean that tooth whitening toothpastes don’t really help? Or does it mean that they are indeed effective and highly recommended? Lets take a closer look at teeth whitening toothpaste in Australia, and give you a recommendation of what we believe is the best teeth whitening toothpaste on the market. Teeth Whitening Toothpaste – Fact or Fiction? It looks the same as regular toothpaste, however it contains slightly different additives; mainly specially made abrasives that polish, and chemicals that aid in breaking down or dissolving tough stains. Need white teeth, fast? keep looking. Whitening toothpaste is not a fast process by any means; most popular brands recommend using whitening toothpaste twice a day for anywhere between 3-6 weeks to see any type of results. You’ll find it lining the shelves of supermarkets and chemists in special looking packaging that include wild claims of whiter and brighter teeth, however do a simple search online (type in “does whitening toothpaste work?”) and you’ll hear a different story. When choosing a brand of teeth whitening toothpaste, always look for the American Dental Association seal of approval, which means you can be sure that the product you’re using is safe, and wont irritate your teeth or gums. Peroxide is the main ingredient in teeth whitening gels, so if you see that a brand of toothpaste contains peroxide, it may be better than brands that do not. Toothpastes today come in different types and brands, and are marketed for different purposes. You’ll find teeth-whitening products, products for sensitive teeth, “natural” toothpastes, toothpastes that target smokers, and even products especially targeting children. At the core however, the ingredients used in most of them are similar: An abrasive agent, Fluoride, flavours, and thickening, sweetening and stabilizing ingredients. The most prominent ingredient used by tooth whiteners is an abrasive agent which actually “scrubs” the stains off the enamel of the teeth. Some toothpastes, like Colgate’s Advanced Whitening product, and Woolworth’s Home-brand Freshmint Toothpaste use hydrated silica for their abrasive agent, while White Glo Extra Strength Coffee and Tea Drinkers Formula use a calcium carbonate-based abrasive. Just as using an abrasive tool or product on household dirt and grime can dislodge it from walls, floors and other surfaces, so too can the use of toothpaste-based abrasives remove stains from the surface of the teeth.....or can it? If used regularly, and in conjunction with supervised dental recommendations, tooth ﻿whitening products can actually help to remove the buildup of stains and prevent further discoloration. Unfortunately, we don't have any teeth whitening toothpastes to recommend, because teeth whitening toothpaste does not work enough to call it a teeth whitening solution! If you're looking for whiter teeth on a budget, consider using an at-home whitening kit or trying dental chair cosmetic teeth whitening, such as zoom teeth whitening. 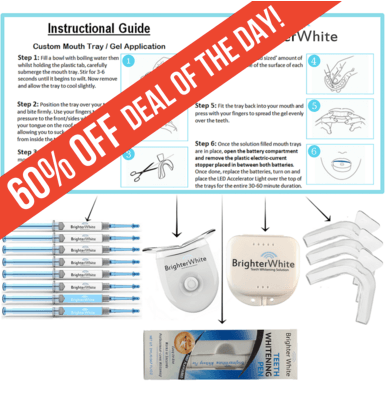 You can find out more about the best teeth whitening products by starting on this page. THE BOTTOM LINE: Tooth whitening toothpastes and over-the-counter products (things that you can readily purchase in supermarkets or chemists) WILL NOT whitening your teeth to a noticeably different level; they will merely stop the buildup of stains and prevent your teeth from further discoloration. Considering that you pay a premium for this special 'tooth whitening' toothpaste (lets be honest, its just toothpaste thats being marketed in a different way) we recommend that you SAVE YOUR MONEY and put it towards a teeth whitening product that actually works.